(a) Using a straight hexagon wrench 14, remove the 2 screw plugs. HINT: Store the lifters in the correct order so that they can be returned to their original locations when reassembled. (a) Using SST, compress the valve spring and remove the 2 retainer rocks, retainer, spring, spring seat and valve. HINT: Store the valves, valve springs, spring seat, retainer rock and spring retainers in the correct order so that they can be returned to their original locations when reassembled. (a) Using needle-nose pliers, remove the oil seal. (a) Using a precision straight edge and a feeler gauge, measure the surface contacting the cylinder block and the manifolds for warpage. If the warpage is greater than the maximum, replace the cylinder head. (a) Using a dye penetrant, check the combustion chamber, intake ports, exhaust ports and cylinder block surface for cracks. If cracked, replace the cylinder head. (a) Check the valve overall length. If the overall length is less than the minimum, replace the valve. (b) Using a micrometer, measure the diameter of the valve stem. If the diameter is less than the minimum, replace the intake valve. (c) Check the valve head margin thickness. If the margin thickness is less than the minimum, replace the valve. If the diameter is less than the minimum, replace the exhaust valve. (a) Using a vernier caliper, measure the free length of the valve spring. (b) Using steel squares, measure the deviation of the valve spring. If the deviation is greater than the maximum, replace the valve spring. (c) Using a spring tester, measure the tension of the valve spring at the specified installed length. If the installed tension is not as specified, replace the valve spring. (a) Using a caliper gauge, measure the inside diameter of the guide bush. (b) Subtract the valve stem diameter measurement from the guide bush inside diameter measurement. If the clearance is greater than the maximum, replace the valve and guide bush. (a) Heat the cylinder head to approximately 80 to 100 C(176 to 212 F). (b) Using SST and a hammer, tap out the guide bush. (a) Using a caliper gauge, measure the bush bore diameter of the cylinder head. 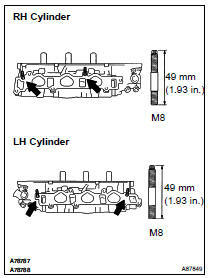 If the bush bore diameter of the cylinder head is greater than 10.313 mm (0.4060 in. ), machine the bush bore to the dimension of 10.345 to 10.363 mm (0.4073 to 0.4080 in.). HINT: Use different bushes on the intake and exhaust. (c) Using SST and a hammer, tap in a new guide bush to the specified protrusion height. (d) Using a sharp 5.5 mm reamer, ream the guide bush to obtain the standard specified clearance between the guide bush and the valve stem. (a) Apply a light coat of prussian blue (or white lead) to the valve face. (b) Lightly press the valve against the seat. NOTICE: Do not rotate the valve. 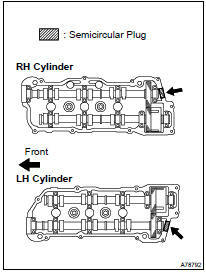 (c) Check the valve face and valve seat according to the following procedure. If blue appears 360 around the valve face, the valve face is concentric. If not, replace the valve. If blue appears 360 around the valve seat, the guide and valve face are concentric. If not, resurface the valve seat. Check that the valve seat contact is in the middle of the valve face with the width between 1.0 to 1.4 mm (0.039 to 0.055 in.). NOTICE: Releasing the seat-cutter pressure gradually helps to make smoother valve seat faces. (a) If the seating is too high on the valve face, use 30 and 45 cutters to correct the seat. (b) If the seating is too low on the valve face, use 60 and 45 cutters to correct the seat. (c) Handrub the valve and valve seat with an abrasive compound. (d) Recheck the valve seating position. (a) Using a micrometer, measure the lifter diameter. (a) Using a caliper gauge, measure the lifter bore diameter of the cylinder head. (b) Subtract the lifter diameter measurement from the lifter bore diameter measurement. If the oil clearance is greater than the maximum, replace the lifter. If necessary, replace the cylinder head. (a) Install the camshaft timing gear assembly. (b) Install the camshafts to the cylinder head. Install without valves and sub gear. Install with its timing mark matched. (c) Set the dial indicator to the teeth of the intake camshaft at a right angle (90 ). (d) Measure the backlash of the camshaft timing gear at least 4 positions. If the backlash is greater than the maximum, replace the camshafts. (b) Using a dial indicator, measure the thrust clearance while moving the camshaft back and forth. If the thrust clearance is greater than the maximum, replace the camshaft. If necessary, replace the bearing caps and cylinder head together. (a) Clean the bearing caps and camshaft journals. (b) Place the camshafts on the cylinder head. (c) Lay a strip of plastigage across each of the camshaft journal. (d) Install the bearing caps. NOTICE: Do not turn the camshaft. (e) Remove the bearing caps. (f) Measure the plastigage at its widest point. If the oil clearance is greater than the maximum, replace the camshaft. If necessary, replace the bearing caps and cylinder head together. NOTICE: Completely remove the plastigage. (a) Using a plastic-faced hammer, tap in a new ring pin to the specified protrusion height. (a) Using paint, mark the standard position from the edge. HINT: Use either end of the spark plug tube. (b) Apply adhesive to the spark plug tube where it will be pressed into the cylinder head. Install the spark plug tube within 3 minutes after applying adhesive. Do not deform the spark plug tube. Do not expose the seal to coolant for at least 1 hour after installing. (c) Using a press and wooden block, install the spark plug tube to the required protrusion height. NOTICE: Be careful not to drip the adhesive. (a) Using a wooden block and hammer, tap in 2 new PCV pipes until its top edge is flush with the cylinder head edge. 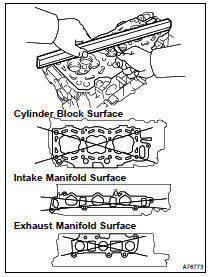 NOTICE: Be careful not to damage the cylinder head edge. (a) Install the stud bolts on the intake side. (a) Install the stud bolts on the exhaust side. (a) Apply a light coat of engine oil on the valve stem. NOTICE: Pay close attention when installing the intake and exhaust oil seals. For example, installing the intake oil seal into the exhaust or installing the exhaust oil seal to the intake can cause installation problems later. HINT: The intake valve oil seal is light brown and the exhaust valve oil seal is gray. (b) Using SST, push in a new oil seal. NOTICE: Failure to use SST will cause the seal to be damaged or improperly seated. (a) Install the valve, spring seat, valve spring and spring retainer. NOTICE: Install the same part in the same combination to the original locations. (b) Using SST, compress the valve spring and place the 2 keepers around the valve stem. (c) Using a plastic-faced hammer and a discarded valve with its tip wrapped in tape, lightly tap the installed valve to ensure that it is securely fit. NOTICE: Be careful not to damage the installed valve stem tip. NOTICE: Install the same parts in the same combination to the original locations. (b) Using SST, compress the valve spring and place the 2 keepers around the valve stem. (a) Apply a light coat of engine oil to the valve lifter. NOTICE: Install the same part in the same combination to the original locations. (b) Install the valve lifter. (c) Check that the valve lifter rotates smoothly by hand. (a) Remove any old seal packing (FIPG) material. (b) Apply seal packing to the semicircular plug grooves. (c) Install the 2 semicircular plugs to the cylinder heads. Install the plugs so that they are flush with the top of the cylinder head. Install the semicircular plugs within 3 minutes after applying seal packing. Do not expose the seal to engine oil for at least 2 hours after installing. (a) Using a straight hexagon wrench 14, install 2 new gaskets and the 2 screw plugs.